The reliquefaction plant is designed to maintain a constant tank pressure at a maximum ambient air and sea water temperatures. The method of operation will depend on the design of the plant installed. Refer to the Builders Cargo Manual for the correct operation of the plant. The plant may be capable of being operated in a number of ways. Selection depends upon the grade of cargo, suction and discharge temperatures of the LPG compressors, and suction and discharge pressure differential across the LPG compressors. In general, reliquefaction without desuperheating between the first and stage compression is possible only if the 2nd stage suction temperature is less than +150°C. For Butadiene the temperature of the compressor discharge must be less than +60°C. With VCM this must not be allowed to exceed +90°C. This is to prevent polymerisation. With ammonia it is usual to run the compressors with desuperheating between the first and second stages. Most hydrocarbons are reliquefied without intercooling, although the thermal reliquefaction capacity using this method is between 5% and 10% lower than with intercooling. During cooling the operating parameters of the compressors change - suction pressure decreases, pressure ratio and discharge temperature increases, and during the latter stages of reliquefaction it is possible that intercooling may be required. When reliquefying Propylene and Propane using two stage compression with intercooling, control of the 1st stage discharge temperature can be affected by changing the level of the liquid in the intercooler. Increasing the level reduces the temperature. An accumulation of non-condensable gases in the condenser will reduce the refrigerating capacity of the plant. These should be separated out in the purge condenser and blown to atmosphere. If, for any reason, the non-condensable gases comprise mainly hydrocarbons (methane, ethane, ethylene) or cargo gas, and it is not possible to vent via then masts, they can be injected back to the cargo tanks via the stripping/condensate lines. Purge control should always be done slowly, carefully and under supervision. Pressure fluctuations can lead to high temperatures at the compressor causing automatic shut down of the plant. Throughout the voyage, including reliquefaction, the level of liquid in the cargo tanks must be monitored and controlled. to prevent overfilling. Difficulties can arise with some cargoes containing water or unsuitable inhibitors, at temperatures below +5°C, due to the formation of hydrates which can block the deep well cargo pumps. To prevent this the following precautions are recommended. During loading, the cross-over filter is to be regularly drained. Inspect the cargo via the stripping line and the sump sampling line for water content after loading, and regularly thereafter. Water is to be evacuated. During the voyage periodically turn the cargo pump shaft. If movement is difficult the motor is to be rotated for some time to clear. If the pump is blocked methanol injection can be tried, although this is an expensive and not altogether reliable method of clearing a blockage. There is no guarantee that injecting an anti-freeze liquid onto a block of frozen material will cause it to unfreeze any more than the immediate contact surface. Intercooling is used in conjunction with two stage compression. The first stage discharge is desuperheated in the intercooler and returned to the 2nd stage The discharge from the 2nd stage is condensed in the condenser, and thence to the intercooler for further cooling. The condensate is returned to the cargo tank. Non-condensable gases are separated out in the purge condenser and transferred by the cross over line to the collector and mast, or via the stripping or bottom distribution lines back into the cargo tank. If two or more tanks are being reliquefied simultaneously via one cargo system the distribution of condensate between the tanks is to be controlled manually. If, during intercooling, there is insufficient condensate in the intercooler drum, additional liquid can be transferred from the cargo tank using the stripping/condensate line and a cargo pump. This is more likely to occur during the early stages of intercooling, or if the 2nd stage compression temperature is too high. The condenser pressure is to be maintained at approximately 1 bar above the saturation pressure of condensate at the condensate temperature. Gas is drawn into the 1st stage of the compressor from the tank, via the surge drum (if fitted), compressed and discharged through the intercooler, but without cooling. The gas is liquefied in the condenser, expanded to tank pressure and returned via the spray or stripping/condensate line. 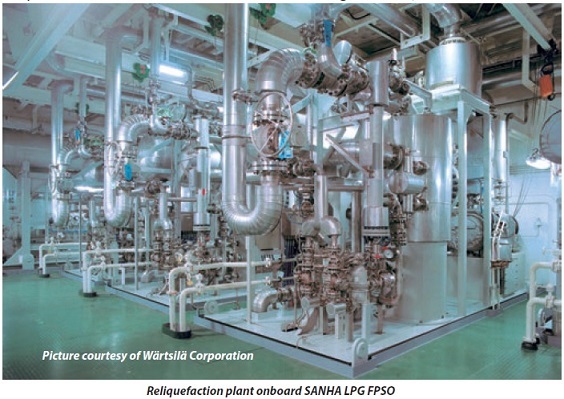 When several tanks are being cooled simultaneously by one reliquefaction plant, the operation should start with the tank having the highest pressure. Pressure is to be equalised before the tanks are interconnected. Also, when several tanks are being cooled simultaneously a careful watch must be kept on the liquid return to ensure equal filling.